Mix all ingredients together and divide in muffin tins. Preheat oven 350 and cook 30-35 mins. Freezes well. I freeze mine in individual size portions. Makes 12 serves at 130 calories per serving using ground beef and 95 calories per serving using ground turkey. I just LOVE this recipe! 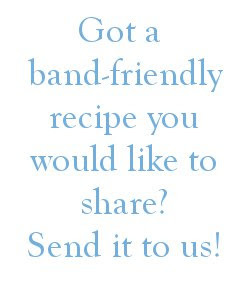 I gave a few to my neighbor (a non band-ster)and she asked me for the recipe. Thank you for sharing it with us.